A lot of people assume that sending prayers upon the Prophet is something to be looked down upon or left to the realms of those who commit religious innovations. Such a view is completely erroneous. The Prophet ﷺ was no more than a man, but the best of mankind. 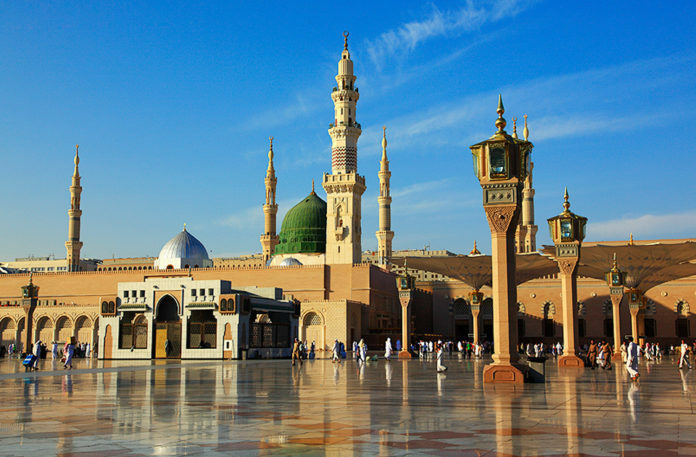 He was no more than a Prophet, but the sayyid, leader and seal of all Prophets. He was no more than a messenger, but one who delivered the greatest and complete message. O you who believe! Send Salah on him, and greet him with the Islamic way of greeting.  Whoever sends a prayer upon me, Allah sends ten upon him.  Do not take my grave as a place of habitual ceremony. Send prayers upon me, for verily your prayers reach me wherever you are.  A miser is one whom when I am mentioned to him, fails to send prayers upon me.  When any Muslim sends greetings to me, Allah returns my soul to me so that I may respond to his greetings. Many of the ancient scholars opined that salah upon the Prophet means mercy. According to this opinion, when one prays to Allah, he is asking for Allah’s mercy, and if he prays upon the Prophet ﷺ, he is asking Allah to have mercy on the Prophet ﷺ. Ibn al-Qayyim was of the view that for Allah to pray over His Prophet ﷺ means Allah’s praise for the Prophet in the heavens. This is substantiated by a narration in al-Bukhari that Abu al-Aaliya said: Allah’s prayer upon His Prophet is for Him to praise him amongst His angels. According to this view, for the angels or human beings to send prayers upon the Prophet, is asking Allah to praise the Prophet and exalt his status. The word ‘Aal’ in the Arabic language refers to a persons family as it also refers to his followers. Hence, the scholars have differed with respect to the word ‘Aal’ that occurs in the syntax of prayers upon the Prophet ﷺ, as to what exactly it refers to. One view (favoured by the Shi’ite) is that ‘Aal’ refers to those of the Prophet’s family to whom it is forbidden to give Zakah. Another view (endorsed by the Hanbali school of law) is that ‘Aal’ refers to all those who follow the Prophet ﷺ until the Day of Resurrection. This is also reportedly the view of the Companion, Jabir ibn ‘Abdullah. Some Hanbalis such as Ibn Qudama and al-Majd Ibn Taymiyyah (the grandfather of shaikhul-Islam Taqi-ud-din ibn Taymiyyah) held that “Aal” refers to God-fearing members of the ummah. It is often claimed by extreme sufis that salafis hate the Prophet ﷺ or refuse to revere him, and consequently, dislike sending prayers upon the Prophet. Such a view is an unashamed lie given that salafis generally tend to view the sending of prayers upon the Prophet during prayers as obligatory and that the sending of prayers is as an act of worship by which one may draw close to Allah. What salafis refuse to do is afford the Prophet ﷺ the same amount of attention or reverence they do to Allah to the beloved of Allah, may Allah unite us with him at the hawd, as he ﷺ is not equal in stature to Allah, Lord of the great throne. Next articleHow was Isa (Jesus) – peace be upon him – Created?